The Food and Drug Administration is preparing to strictly limit the sales of flavored e-cigarette products to try to keep them out of the hands of children and teenagers, a senior FDA official told NBC News Thursday. In guidance to be issued next week, the FDA will restrict the sales of flavored, cartridge-based vaping products such as Juul to only tobacco shops and vape shops. “We are going to restrict the ability of e-cigarette manufacturers to sell the flavored products in convenience stores,” the official, who spoke on the condition of anonymity, said. FDA Commissioner Dr. Scott Gottlieb has said he is alarmed by what he calls an epidemic of vaping by teenagers and younger kids. Especially worrying is the rise in the use of cartridge-based products such as Juul, which deliver a hefty dose of nicotine alone with flavorings in a discreet, easy-to-hide device. “This is only going to apply to the cartridge-based systems so they won’t affect the open pen vaping systems by and large,” the official said. The Washington Post first reported the FDA’s plans Thursday. The Centers for Disease Control and Prevention reported Thursday that adult smoking rates have dropped to their lowest level yet, at 14 percent. But the CDC found that 47.4 million U.S. adults , or 19 percent of the adult population, uses any tobacco product, including cigarettes, cigars, or e-cigarettes. Public health experts have been complaining that the fruity, candy-like flavors found in e-cigarettes are targeted directly at children and teenagers, and rates of teen cigarette use have soared. The FDA has also expressed concern about online sales to teens. In September, the FDA made an unannounced visit to Juul headquarters to look for evidence about the company’s marketing practices. In April, the agency launched what it called a “blitz” to stop retailers from selling vaping products to underage children. And it has warned several online sites about sales. Next week, the FDA will do more, the official said. “We’re also going to restrict online sales only to sites that put in place specific age verification measures and limit access to kids that we are going to specify in guidance,” the official said. The FDA action will not affect menthol or mint flavored products. That’s because, the official said, it hasn’t yet been able to limit the use of menthol in traditional, combustible cigarettes. “We don’t want to create a situation where the combustible products have features that make them more attractive than e-cigarettes,” the official said. 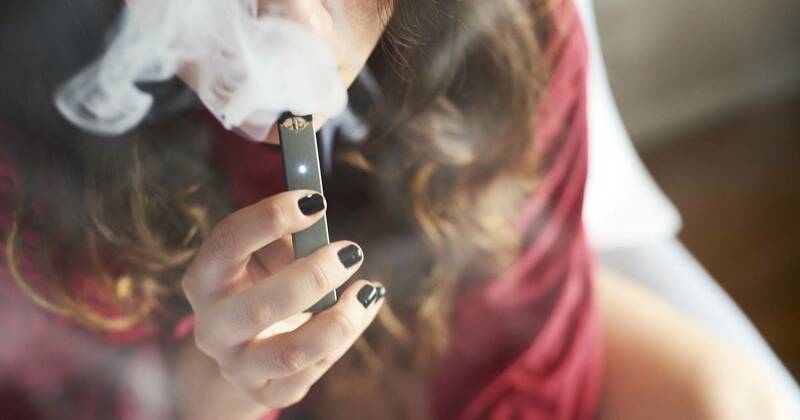 Public health groups including the American Heart Association, American Lung Association, American Academy of Pediatrics, the Campaign for Tobacco-Free Kids, Truth Initiative and the American Cancer Society Cancer Action Network, have been urging the FDA to move faster and to remove Juul from the market until it undergoes an FDA review. The FDA and CDC both say it’s not clear whether e-cigarettes are safer than smoking burnt tobacco, but agree the nicotine in both is highly addictive and that teenagers should not use either. Consumer and health groups said the FDA should do more. “To reverse the epidemic of youth e-cigarette use, the FDA needs to stop the sales of all flavored e-cigarette products that have not been subject to public health review by the FDA as the law requires,” the Campaign for Tobacco-Free Kids, American Academy of Pediatrics, American Cancer Society Cancer Action Network, American Heart Association, American Lung Association and Truth Initiative said in a joint statement. Maggie Fox is senior writer for NBC News and TODAY, writing top news and analysis on health policy, science, medical treatments and disease. April 17, 2019 Comments Off on E.P.A. Moves to ‘Close the Door’ on Asbestos. Consumer Groups Say Loopholes Remain.